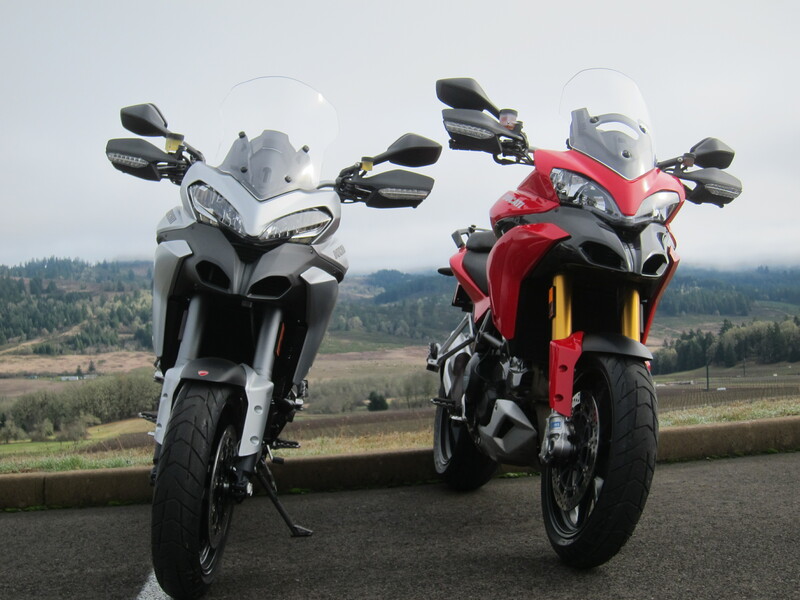 The weekend before last I had the privilege of riding, back to back, two great motorcycles: the 2010 Multistrada and the brand new 2013 Multistrada. After a short three years in production we have here a rather long list of changes in the 2013 model. The motor and the suspension are where the key changes were made, I would call one evolutionary, the other revolutionary. So, what are these changes and how do they translate into the riding experience? Is it an improvement? Would these changes go as far as making you call the 2010-12 models “old school” bikes (not that there is anything wrong with that)? So let’s find out. 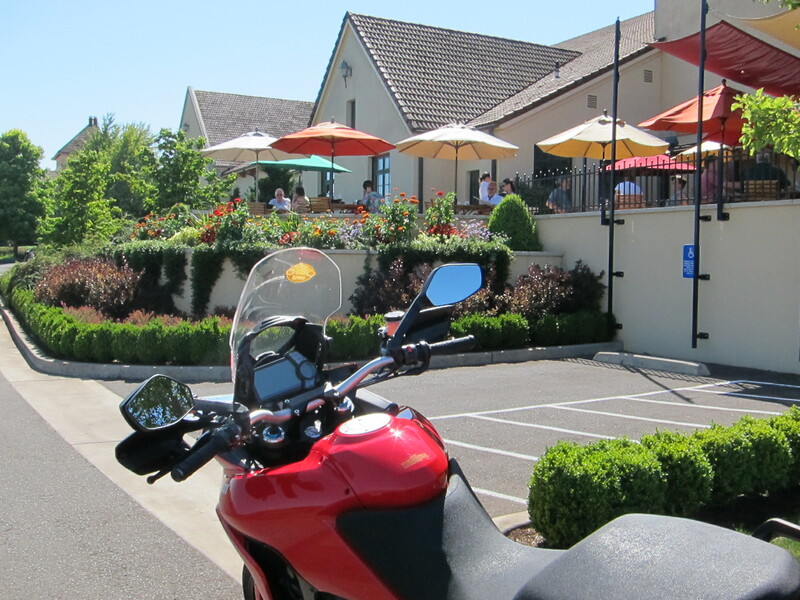 To do it properly, I asked the great folks at European Motorcycles of Western Oregon (thanks Scott and Madelyn) whether I could have both motorcycles available for a test ride. When they graciously gave me an okay I invited my friend Doug to join me in the effort. Effort? Ha! That was some fun! It was love at first sight when I first laid my eyes on the much anticipated 1200 Multistrada back in 2010. 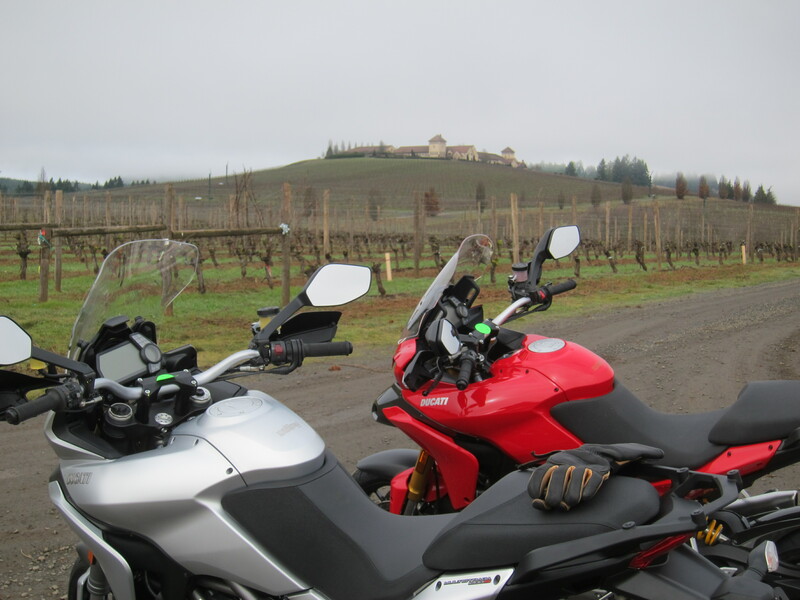 Once it showed up at the European Motorcycles of Western Oregon I took the 2010 Multistrada S (Sport) for a test ride and I was immediately impressed by its power, loved the ergonomics, how the bike feels light, the oh-so-sweet fast turn in, and the Ducati 1200 cc L-twin motor experience. That motor… you twist the throttle and on the blink of an eye you are on the next zip code. If your arms did not fall off their sockets, there is. Because you are doing all of that while riding on a very comfortable, and even plush, I would venture saying, upright touring / enduro / motard riding position. I couldn’t find a way to describe that riding experience with the Multistrada, but the word “visceral” was what came to mind at that time. The motor on this bike has a successful racing pedigree, based on the 1198 Superbike motor, from where it was tuned down for a street application, and Ducati called it the 11 degrees Testastretta, referring to the narrower valve overlap as compared to the 30-something degrees on the original 1198 motor. Making such motors rideable on the street and also have them meet fuel emissions is not an easy task. The result of this first incarnation of the TestaStretta was that it has all the power you may want but it runs lean hence poorly (surges) at anything less than around 3 to 4 thousand rpm at constant throttle position. It actually doesn’t feel really good until you get past the 5,500 rpm. Ducatisti around the world proudly justify this as par for the course in the forums, “that’s what gives it character” they say. But in reality many of these same owners work on the few available fixes, not perfect solutions and sometimes quite expensive, but in the end it shows great improvement. Although I like the rough on the edges contrast you experience between that wild motor and the overall refined design concept of the 4 in 1 bike, it was not quite what I was looking for on a motorcycle. I would had preferred another Jekyll and Hyde proposition: A motor subtle and smooth for the “touring” mode, but which is capable of showing its wild character upon a “sport” setting request! And that would make the bike’s 4 modes in 1 concept more realistic as well, in my opinion. I had a chance to ride that very same bike again in September of 2011. Now the bike had some 2,000 miles on the clock, the motor was broken in and some tune work had been done to it and it felt substantially better on the low range. I was still unconvinced, though. After all, it had Urban and Touring modes, right? Shouldn’t these two modes give you a more refined riding experience? In reality I had a feeling I was the only one complaining because this bike was pretty much hitting the top end of the popularity charts. The sales figures were the prove of its success. That wild character was the postcard of this bike, Sport mode was champion! The Four bikes in one concept: Four riding modes from a push of a button on the 2010 model. Admittedly, this bike had a lot more to offer than what could be hindered by my humble impressions of a lumpy motor on partial throttle. Back in 2010 the 1200 Multistrada was a trend setter and it still is today. The idea of a sports bike motor on an enduro style body, offering plenty of comfort for touring, with four riding modes ranging from enduro to urban to touring to sport was new back then. Somehow it is still new today! The Multistrada brought a new perspective to the adventure and sport-touring bikes segment with the electronically controlled suspension setup based on top-of-the-line Ohlins suspension systems which was and still is a major hit for performance riding. Other manufacturers are only now arriving at what Ducati has had for three years already. Like Audi, their new partner, once used in their adverts, much before the start of their joint venture last year: “you lead or you get out of the way.” Who could have imagined Audi and Ducati together back then, right? But that is another story. Ohlins, Baby! Offered on 2010-12 model S and Touring! The story of three years on the market. Ducati has sold 20,500 Multistrada 1200s since its launch in 2010 and it surprised me to see that, for 80% of buyers, this was their first Ducati. They ride, on average, 50% more than the typical Ducati owner (no jokes, please) and the stat that stands out most is that the previous bike MTS1200 owners came from is equally split between sportsbikes, naked bikes and adventure bikes. This motorcycle conquered slices in the sales pie of the adventure, sport and naked bikes segments. Prove that the 4 in 1 concept worked, and more than that, it offered an alternative that was nonexistent until then in its merge of comfort ergonomics with a sport performance. This bike makes its own segment and its uniqueness remains. Furthermore, this bike became an introduction to Ducati to many riders around the world. Success nonetheless. When I visited the Ducati factory and museum in 2011 they proudly talked about the Multistrada as their best seller bike at that time. 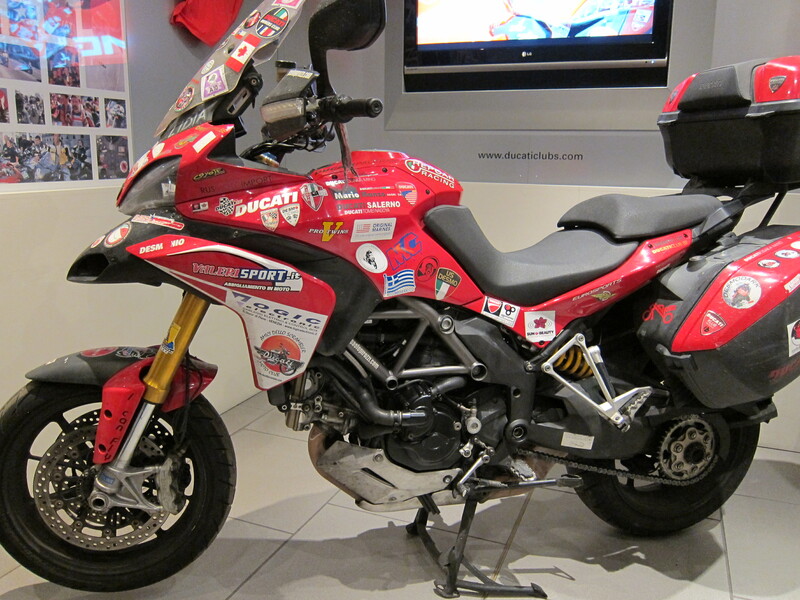 While there I had a chance to meet Lidia, the Multistrada that went around the world in a promotion stunt which was proudly displayed in its own room in the museum. But I digress. Again. Lidia, the multistrada that went around the world with Paolo Pirozzi in 2010. Ducati Museum, Borgo Panigale, Bologna, Italy. October 26th, 2011. So why change, you may ask? In soccer we often say we don’t change the roster of players nor the game strategy when the team is on a winning streak. But of course, there is much more to that on the motorcycle world. I see two reasons for change that make sense to me. One is Ducati’s official story. 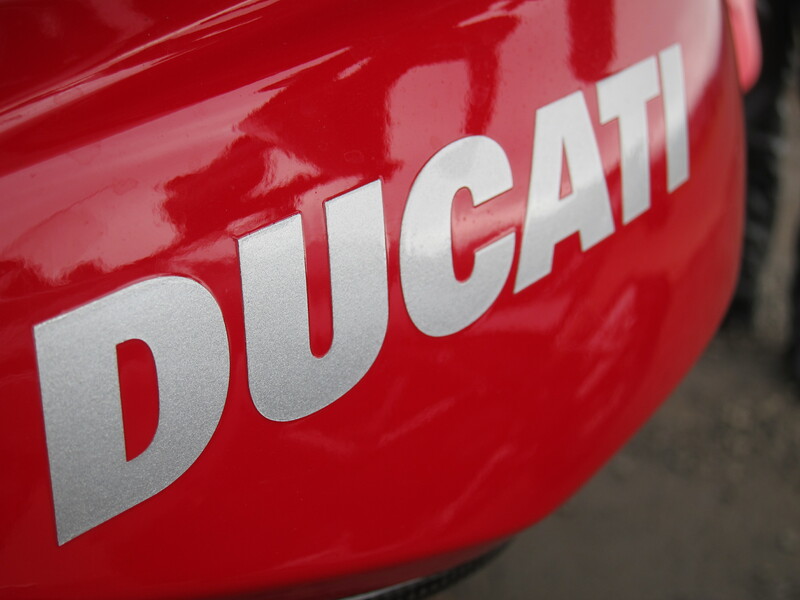 Ducati claims the changes implemented in the 2013 model are a result of their consultation to customers and from data gathering of riders’ opinions on motorcycle forums. I wasn’t alone on my complaints after all! The bottom line was to make the Multistrada a motorcycle with a stronger touring capability and fix a few niggling issues here and there. This could serve two objectives: consolidate their newly acquired customer base by offering an upgrade and improved product; and conquering yet more new customers by offering a better touring product which taps into a larger more mature slice of the market. Ducati’s move with this bike in its 2013 fashion could be to assume a more mainstream position by offering a de facto touring machine. But which still had that wicked sport mode! They wouldn’t want to lose that edge, right? On the other hand, we can also speculate how Ducati wants to keep this bike at the trend setter position it started in 2010. Other manufacturers are catching up to Ducati’s challenge and are offering motorcycles with riding modes and electronically controlled suspension systems not unlike what Ducati has been offering on this bike since 2010. And not only that, they are also offering semi-active suspension systems on 2013 models. 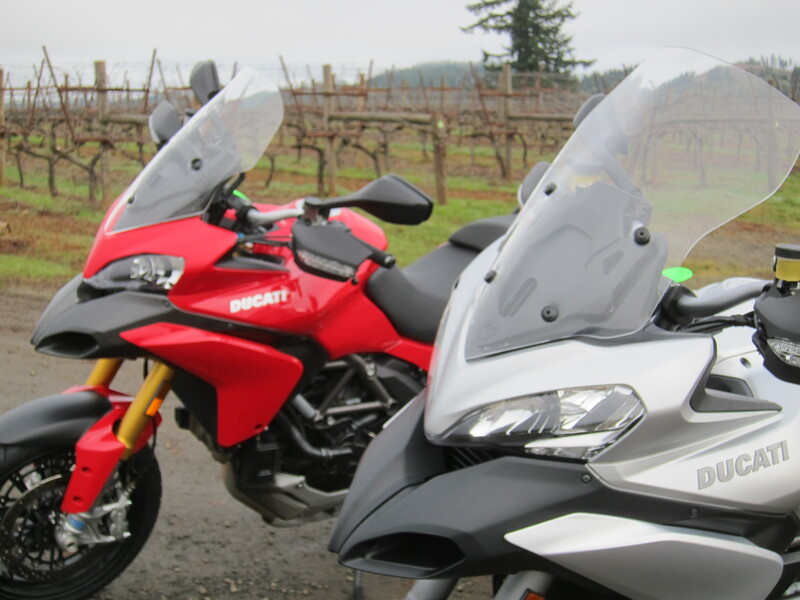 Two examples are the 2013 BMW R1200 GS and the 2013 Aprilia Caponord. And there is more: I’ve heard a rumor that one major and traditional manufacturer of large adventure motorcycles of the 1200 cc variety (which I will keep nameless here because it is a rumor, despite the fact that rumors always have a hint of truth…) wanted to emulate some of the Ducati feel on their heavily revised 2013 model. Too much of a hint? Anyway, you lead or get out of the way, right? Ducati is again taking chances with this bike, introducing changes including the new semi-active suspension technology to the motorcycle market. LED headlights for low beam. Besides being brighter and more visible to traffic, its lower power consumption allows for low and high beams to be on at the same time, improving illumination overall. High beams remain the same as previous models. Upgraded ABS brakes with three levels of interference including levels of front and back linked actuation, which changes depending on the riding modes (latest version of Bosch’s 9ME ABS system). 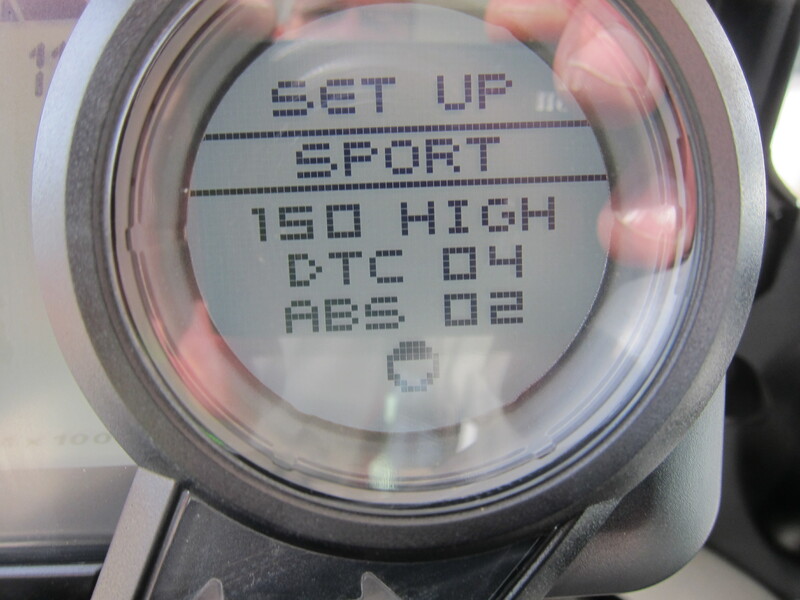 Upgrade to the 8 level Ducati traction control (DTC) sporting smoother interference with torque reduction of up to 60 per cent now controlled by retarding the ignition, and the fuel injection being interrupted only for greater levels than that. New windshield with better wind protection and which allows one hand operation, so you can move it up or down on the go. Other cosmetic changes, like wheels, the stickers are gone in place of high relieve plastic, slight changes to the shape of the headlight, the seats, and perhaps other things that I have missed. There is a shuffle on the models available: A base (no semi-active suspension) continues to be available, and the Touring model is also available, the S model disappears and in its place you get only the Pikes Peak version. And a Gran Turismo model appears. This one really shows the new direction towards a more touring appeal. The bike comes in only a graphite color, with a few accessories that make it more geared for touring (higher screen, different seat, fog lights, engine protection bars, and tires more geared for touring than sports performance). 2013 Multistrada 1200 Granturismo. Photo form Ducati press release. But the two main areas of change as mentioned earlier are in the motor and in the suspension. I recommend you check “Ash On Bikes” for Kevin Ash’s excellent comprehensive technical review of the specific changes to the motor and suspension, including Ducati’s diagrams explaining in detail the changes. It is worth a look, I guarantee you that. But to summarize, these changes make a lot of sense to me, they say it is smoother at the partial open throttle range. It has a 5% increase in torque and up to a 10% reduction on fuel consumption. With its Dual Spark (DS) plugs per cylinder, angle of fuel injection more directly across the intake duct, and an auxiliary air injection, you can call it an evolutionary change. Ducati calls this new motor the Testastretta 11 degrees DS. And the revolutionary change is on the suspension. Ohlins electronically controlled suspension is out, Sachs semi-active suspension is in. It is the Skyhook semi-active suspension, Ducati calls it DSS. This type of suspension has been in the auto industry for several years already. Ferrari and Maseratti are great examples, but it has become more prevalent on other top tier car manufacturers as well. Semi-active suspension allows for on-the-fly, fraction-of-second changes to compression and damping that are based on several parameters (speed of travel, throttle position, brake actuation, measurements of front and rear wheel travel if I haven’t forgotten something). The objective of this suspension is to maximize wheel contact with the pavement while maintaining the chassis as stable as possible. In theory it improves traction while also improving rider comfort. Again, I recommend you check Kevin Ash’s review on the “Ash on Bikes” site linked above. You must be thinking too much talk and it is not on the riding experience. So here we go. We got a scheduled date for the ride and I counted the days waiting for it to arrive. The day it was scheduled, a Saturday morning, Doug and I met for coffee early before getting to the EMCWOR. Doug shows up on the 850 Moto Guzzi Eldorado. I show up on my Triumph Tiger 800 XC. 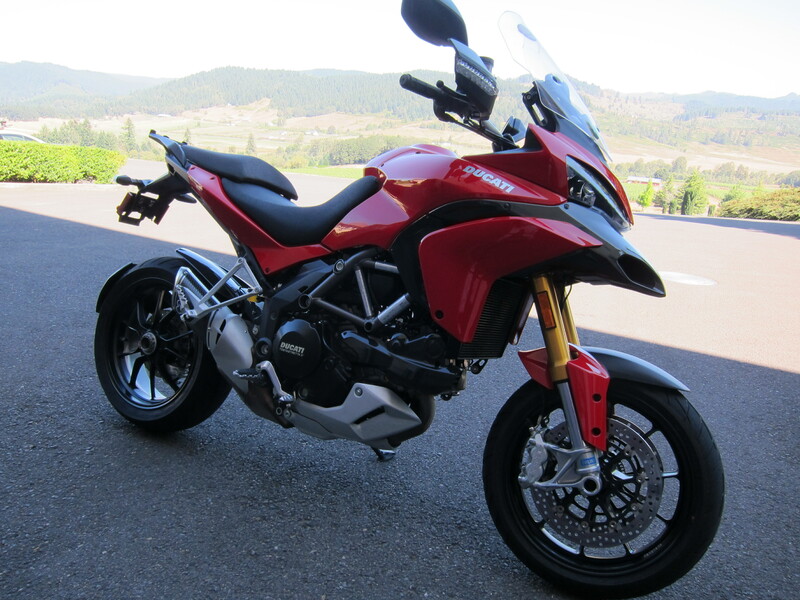 I already know it is a problem selecting a bike to go for a Ducati Multistrada test ride because chances are your motorcycle will feel underpowered when you get back to it after the test ride. You are better off driving a car to the test ride, so you avoid the inevitable comparisons. Follow my advice or you risk buying a new bike! Having Doug join me on the test ride would allow us to have both bikes out at the same time allowing back to back comparisons and an opportunity for a photo shoot. But most importantly I would have someone with whom I could exchange notes along the way, and not just someone, but a guy who knows about motorcycles. I could write a few pages here to describe the portion that I know of Doug’s Curriculum Vitae on motorcycle matters. But let’s just summarize here that Doug is a motorcycle enthusiast with experience on the race track and great overall knowledge on several aspects of motorcycles and motorcycling in general. And I should add that I learn about riding and about motorcycles every single time I go on a ride with him. I was really glad he was available and willing to join me on this ride. Of course, you should know there was no arm twisting here, it was not difficult at all to get him to join me on this ride. EMCWOR provided us with their new 2013 demo bike and a 2010 that has been an executive demo at the shop, my friend of the previous two test rides, now with about 4,700 miles on the clock, with brand new tires. The bikes were ready to go when we showed up at the shop at about 10:00am give or take. 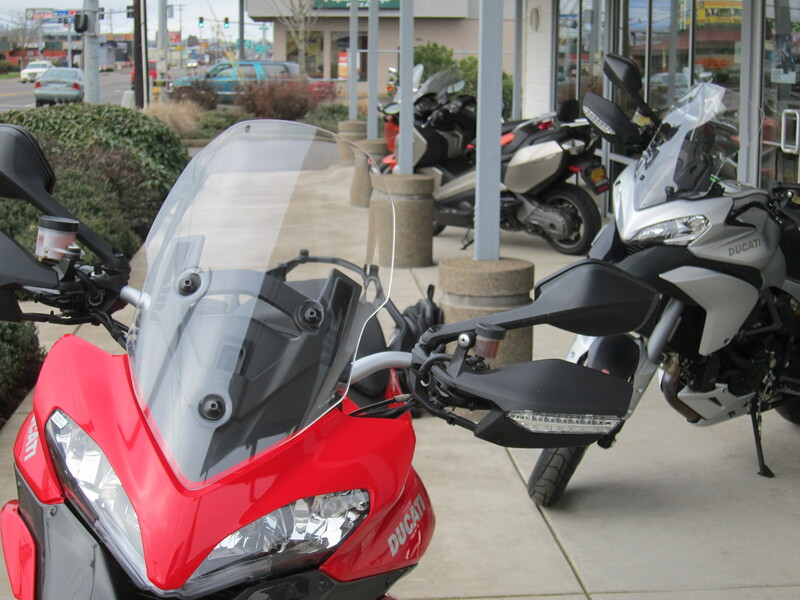 If you haven’t ridden a Multistrada yet, you should know these bikes require instructions regarding the operations of their several systems. It is pretty much intuitive, but it had been a long time since the last time I rode the 2010. And the 2013 has a few important changes and added features that we wanted to know. Below you can see the default set up for sport mode, DTC at level 4 (just below medium interference level, 8 being highest) and ABS at level 2 (less aggressive with independent actuation of front and rear). On Touring, ABS is defaulted to level 1 indicating front and back braking is linked when operated by the handle bar lever. On Enduro, Level 3, you can get rear wheel lock up, if I remember correctly, the order of levels could be inverted and the defaults could be different. What is important is that you can customize each of the riding modes the way you like it. So you can have the 150hp map (touring or sport) with a different set of ABS, suspension damping/compression and DTC that is different than the default. And it will stay there until you change it again or bring it back to default. I asked to ride the 2010 first. I was wondering about what does “evolutionary” meant, so going from the 2010 to the 2013 would tell me the story, if there was a story to be told. The outside temperature was 42 degrees and both bikes showed the ice warning symbol on the dash. I climbed on board of the bike I already know relatively well. I was surprised to realize the 2010 was even smoother than I remember it was last time I rode it in September 2011. I was following Doug going west on 11th at the 35 mph traffic and the bike was doing fine at partial throttle on second gear. I was immediately comfortable with the bike’s ergos. I’m 5’10” and this bike fits me like a glove. A bit taller than my Triumph Tiger 800 XC when I have the Tiger’s seat on its lower position, shorter than the Tiger with the Tiger’s seat on its highest position. But it feels laterally lighter than the Tiger when stopped, which is important when only the ball of one of my feet reaches the ground. Handlebars reach is spot on! Perfect distance seat to pegs. Very comfortable indeed. We took off towards the south hills of Eugene. When we hit the open road we let the bikes show a bit of what they are all about but as soon as we hit the hills we were engulfed in a thick fog. Roads were wet. I slowed down. 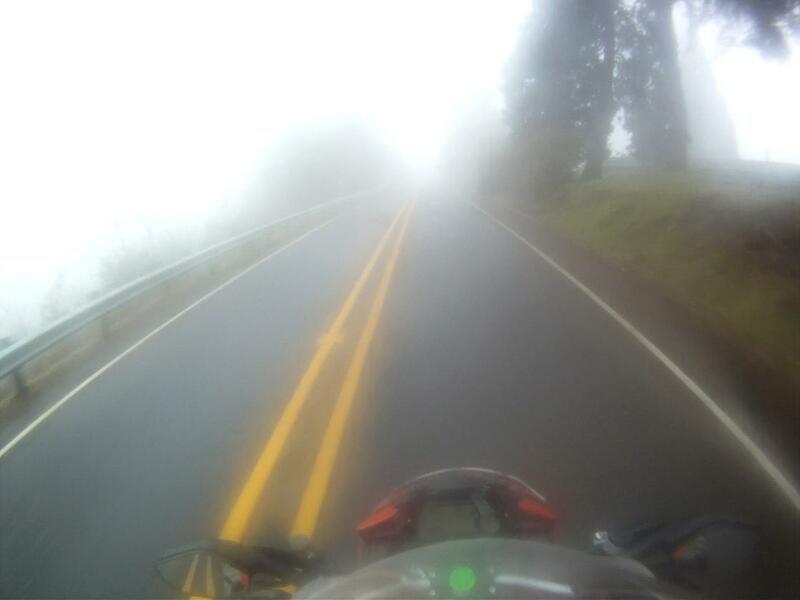 We went towards Crow, OR, to show the bikes to a riding friend of ours and make some time waiting for the fog to lift some. But he was not home, so we took the opportunity to talk about the bikes so far and examine some of the differences about the bikes. When we stopped and helmets were off, first thing Doug said was: “I like this bike!” On one of the intersections, half way there, I had helped Doug change his bike’s mode from Touring to Sport. I think that’s what did it for him! And about the windshields, can you spot the differences? 2013 Windshield is taller, wider, and is shaped differently. Besides being taller, wider and shaped differently, the operation can be made by a one-hand-move, on the go. It is quieter than the previous model. But it is not quiet. And for me it works better on the low position. On the high position if I lower my upper body to a position that actually makes it uncomfortable to be riding at any distance, but it makes it really quiet. I wonder if the windscreen of the Granturismo model, which is taller will offer less wind noise for long distance traveling. There is a slight change on the shape of the headlights. Can you tell? On the new model the top of the headlight cuts towards the front and center of the fairing on a more straight line. Looks less like it is surprised like the previous model and more like it is determined. You can also see the new windscreen is bolted with four attachment points, so they are not interchangeable with the previous model (three bolts). A more straight line on top of the headlight makes it look more determined. The fairing on the front, on that area from the headlights to the dashboard, has a different angle when it connects to the black plastic on the dash. I only noticed that now that I was paying more attention to the photos. Looks better integrated with the dashboard. The upper part of the fairing as well, it has a new indentation where it connects to the wider wind screen. Very small changes that require one to be paying close attention to notice. We got back on the bikes, I was still on the red 2010 bike. We went towards the King Estate Winery, it is always a great setting for photographs. And there is a great set of curves with very rough surface on the way to the winery. The Ohlins suspended bike took it well. I felt some jarring on the handlebars, the bike pitched some, but it was solid. Once at the winery we stopped for more photographs at their entrance road. The rider’s seat on the new bike is a bit longer. That was Ducati responding to some taller riders complaining they felt cramped on the seat. To me it was okay for regular touring, unless on situations when I needed to move around and then I would hit the lip to the passenger seat. I think this change was actually already incorporated on the 2012 model. Another small change is the stitching on the new seat. Looks really nice. The high relieve “Ducati” emblem on the side of the tank in the 2013. I like it better as an adhesive under the clearcoat. We climbed back on the bikes and this time I took the 2013 for the first time. WOW!!! What a difference on the motor. First thing I noticed was when I just blipped the throttle. The motor of this brand new bike seemed surprisingly rev happy. I put first gear and it launched smoothly… it was very, very smooth. And it pulled firm as if the 5% increase in torque was a lot more than that. I would have to say the changes to the motor can be evolutionary on paper, revolutionary on feel! 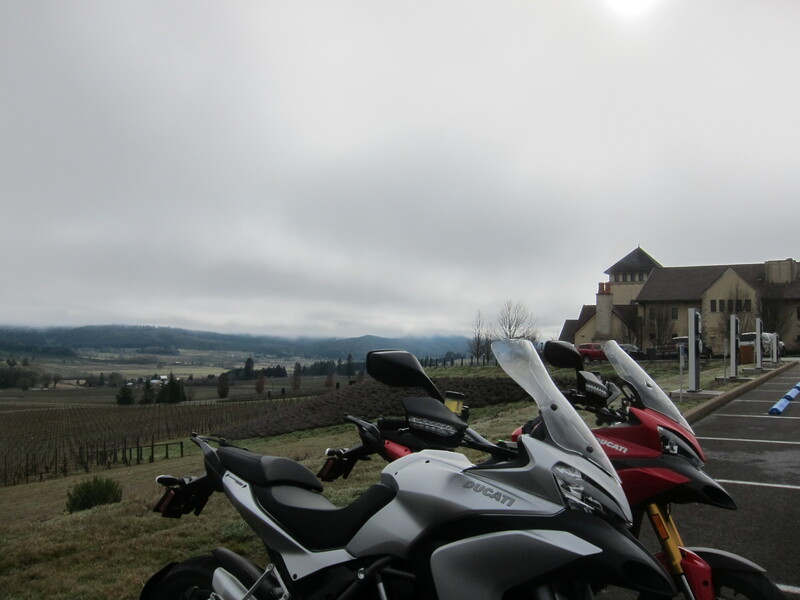 But anyway, it was a short trip to the top of the hill and we parked the bikes again for another photo shoot. Check the headlights. The LED lights are bright. I think they should be more noticeable on the road when facing oncoming traffic, for example, a good thing. I’m looking forward to see what happens at night, with the driving lights and the high beams turned on at the same time, which can be done due to low power draw of the LEDs. One thing to be missed on the new bike is the Ohlins bling and its golden fork legs. And its performance fame. The Sachs shocks are dark grey, do not photograph well but look better in person. There is no brand or logos or anything identifying what it is, just plain matte grey fork legs and matte black wheel axle clamp. That is something interesting as Sachs has been providing performance products for some of the Dakar vehicles. Could be because Ducati bought the rights for the Skyhook concept, which has been terminology used on the field of semi-automatic suspensions for several years already but no one working on it had claimed proprietary rights for the word. By the way, Ohlins has developed their own semi-automatic suspension for motorcycles, called the Mechatronic (= mechanic + electronic?). They plan to eventually offer it as a retrofit model for motorcycles. Think about the possibilities here. We jumped back on the bikes. I’m again on the 2013, I put it back to Touring mode, and we hit the road back to Eugene. I noticed that when just cruising I could ride on the lower part of the fat area of the torque one gear taller than what the motor tells me to do on the red bike. Despite how smooth the 2010 felt when I first started riding it earlier in the day, it still has issues. It is never completely round, except when at about 5,500 rpm and above. And it felt more clearly so when I jumped on the 2013 and its motor felt so much more drivable. It was just unbelievable. Yes, I know, what should a Ducati be all about, right? Where is that rough on the edges experience? Well, I think Ducati is offering a different product here, changing the priorities on this bike, but without compromising its original performance. 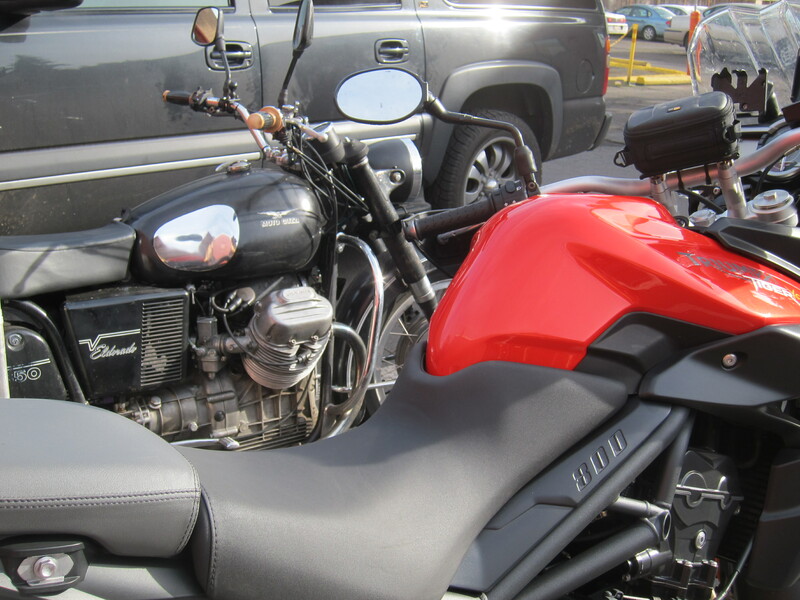 2013 and 2010 Multistradas: two great motorcycles. We continued back to Eugene and we hit the area of the road with the tight curves with rough surface. I was anticipating some level of smoothness and was not disappointed. The feeling I got is that it softened the edges of the road imperfections. At some point Doug had mentioned that he purposefully changed his line on a couple of curves, to see how the semi-active suspension worked on the 2013 and was surprised on how neutral the bike felt at all times. Some journalists indicated the bike does not inspire confidence, giving less feel to the rider. I did not ride to a point where that was ever an issue. Doug did not experience that either, quite the opposite, it felt always very composed. Maybe this could be an issue on the track. For now I liked the simple fact that it was solid and went over the rough surfaces so well. I then moved the bike back to sport mode and got that aggressive throttle response. So it is there, the performance is there. But more the way I like it. A touring bike with a sports motor on tap. That’s the Jackyll and Hyde I was looking for. Thank you Ducati for listening to me (even if it was through other people who thought the same way I did). At some point Doug mentioned: “if I was buying one these two bikes, I would buy the silver one. The red one seems old school.” And I remembered one article I had just read on the July 2012 Motorcyclist magazine about the Ducati 750 SS Imola. That’s the bike that put Ducati on the map, 41 years ago. Imola 200 in 1972 was their first win. And Ducati was only on their second year of production of the V-Twin motors, up until then they only had the big singles. Paul Smart was the Ducati rider who won that race. You should know he was not too keen about riding that bike at first. “They felt pretty awful to ride, and slow too. There was loads of torque, but it seemed to fire every other lamp post” he said. But when he checked his time sheets on practice, he realized he was riding something really special, he was going a lot faster than he perceived it was. Well, I don’t know if Doug was thinking this far back when he mentioned “old school” in reference to a 2010 Multistrada. But that’s how I feel about that motor on the 2010-2012 bikes. There is something raw and rough on the edges about it. That way it is old school. It is deceivingly fast, but it also demands you to work on it as you ride tighter curves, for example, and anytime you let revs fall below 5,500 rpm. We got back to the shop and parked the bikes upfront. Overall I have to say that I was ecstatic with the new bike. The DSS suspension is fine. It actually feels more evolutionary than what its revolutionary design represents. After all, this is a completely new and radical approach to how compression and damping operates. But you only notice it, at least on sport mode, when you hit rough surfaces. Other than that, it feels very composed and un-intrusive. You wouldn’t know it was there until you hit the extremes. And then you would feel what it was meant to do. I would like to try a softer setting to see how it responds to the rough surfaces. Must be even smoother. The motor, on the other hand, that was a complete departure from the previous model’s experience. I enjoyed the extra torque experience and thought about Paul Smart’s quote on the 750 SS and thought what would he say about this bike. It is still deceivingly fast, or faster, but it now fires on every lamp post. It clearly shows it is a V-twin, no questions about that so that part of the Ducati identify of the last 40 years is preserved very well. But it feels more compact, it actually reminded me of the Streetfighter 848 motor, which is something that I really like. As a matter of fact, on sport mode it reminded me of the 848 in terms of feel, responsiveness, sound, but with longer legs and so much more refined on the low range. The only fault is that it is a bit quieter, or it sounds “lighter”, at least that’s what I perceived. But that can be changed with a slip on, if you want it louder. Or a full aftermarket exhaust system. I would not go that far, though. How much more power and sound would one want? I know I should not have asked this question. Soon after we parked the bikes Scott and the guys from the shop came to greet us upfront and to know our thoughts about the new bike. Doug and I were both enthusiastic about the new Bike. But I was really impressed with Doug’s excitement about the new bike. After all, Doug rides many old school bikes. Real old school ones like his 1970-something Moto Guzzi 850 Eldorado. And on our bar conversations, when we talk bikes, he is always the first to show skepticism towards new electronic technology on the bikes. But surprisingly he liked the Skyhook semi-active suspension (DSS). And he also liked the revised motor and felt the red bike required more rider’s work and input during a ride. Which can be a good thing. Or not. When we were walking back to our bikes I mentioned to Doug: “Now we will feel the real difference.” He replied: “I’m the one who will really feel the difference,” as he mounted his 850 Eldorado. The Tiger felt soft, sluggish and heavy. And the Tiger is an awesome bike! Would I buy one of these bikes? The 2013 is really appealing to me. I think Ducati has produced a motorcycle that has a more clear touring capability, without dismissing the sport performance. 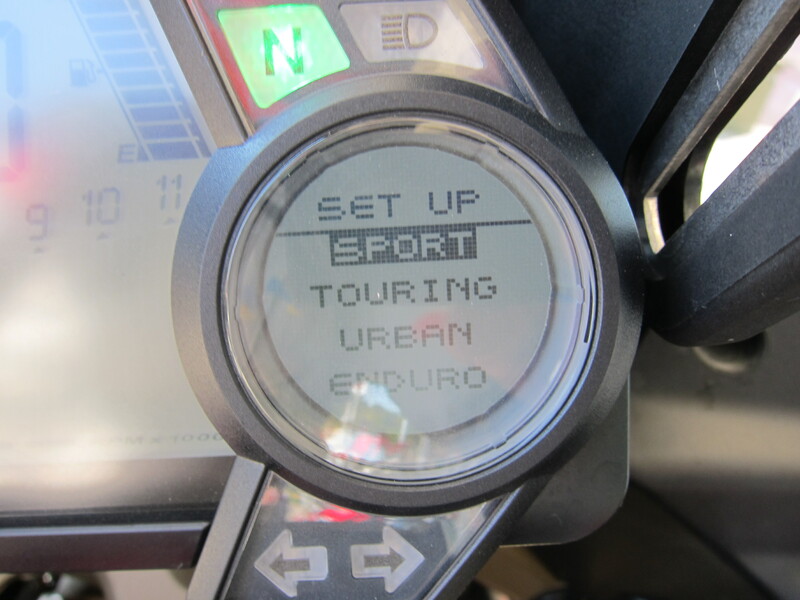 I did not try urban or enduro, but with the touring and sport modes I can more clearly see the distinctions between the two modes. The semi-active suspension is an improvement, evolutionary in feel. Overall it is a more refined motorcycle. For the people who appreciate that old school feel, there are plenty of brand new 2012 bikes still available. An Ohlins bike may become a coveted item. They are not really old school, as they obviously come packed-full of technology. At the shop here in town they have a brand new 2012 on the floor that you can get with some Ducati factory incentives. So if you are interested in that 2012 that is on the floor, in a nice titanium color, stop by at the European Motorcycles of Western Oregon and talk to Scott or Mickey. And there is a brand new silver 2013 on the floor as well (besides the demo bike I rode). And maybe there is a special one to arrive at some point in the future with my name on it. Now, listen to me: if you don’t want to buy one of these bikes don’t take them for a test ride, especially the new one! And don’t say you were not warned! 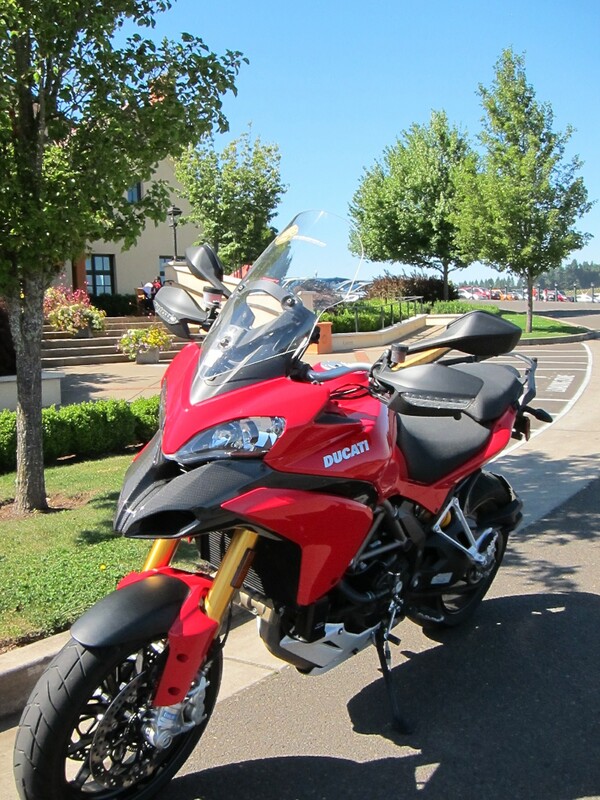 This entry was posted in Bike Reviews and tagged 2012 vs 2013 Multistrada, 2013 Multistrada, Comparison 2012 and 2013 Multistrada, Ducati, Multistrada. Bookmark the permalink. I actually considered trading my 2012 Pikes for the new 2013 model, I believe the new improvements were worth the upgrade…but financially the numbers and depreciation loss I would face were not logical. So I’m pleasantly stuck with my 2012 at least for another year or so. I’m chalking it up to as being in line for the next Multi iteration. Great write-up Cesar, of all the articles and reviews that I have read on this new bike I actually learned somethings from your examination that I had not from the others. The photos look great, and they are the very first side-by-side photos of the new and old models I have seen done anywhere. Thank You! GiL, thanks for your comments. I have to say it was an incredible experience to have a chance to ride these two bikes back to back. It is the only way to really compare the two bikes. You know, when you jump from one bike to the other you notice the differences right away. Anyway, I’m sure the next iteration will be even better than the 2013. One thing I foresee is the color display of the Panigale moving to the Ducati. That will be a nice and needed update. It is just the way things go. Except for my friend Doug who likes old bikes. And incredibly he liked the 2013. Indeed, I already made my mind and in a next post will tell more of the story. Caraca! Vi o seu blog e a critica da Multistrada no Ductalk!! Que legal!! A nice machine indeed. Have you taken one for a spin? But I really the old Multistradas, like the one on your avatar. They have that funny front end… but the 1200’s are not that much better in terms of looks. And still, the overall package is really nice. I have a 2012 Touring and I don’t understand all the fuss about a rough motor at low revs. For me this is the most fun to ride bike on earth and I ride two up with top box 90% of the time. It devours curves with finesse and awesome power and is comfortable for all day rides. It’s light weight great brakes, traction control, ABS and power gives you confidence that you can go faster and safely. I call my Multi GreyDuc Bird of Prey. Yes, I hear some owners of 2010-12 bikes saying there is nothing wrong with it. And there isn’t. But it can be better, I just learned about it when I rode the 2013. But it could be a question of preference here. 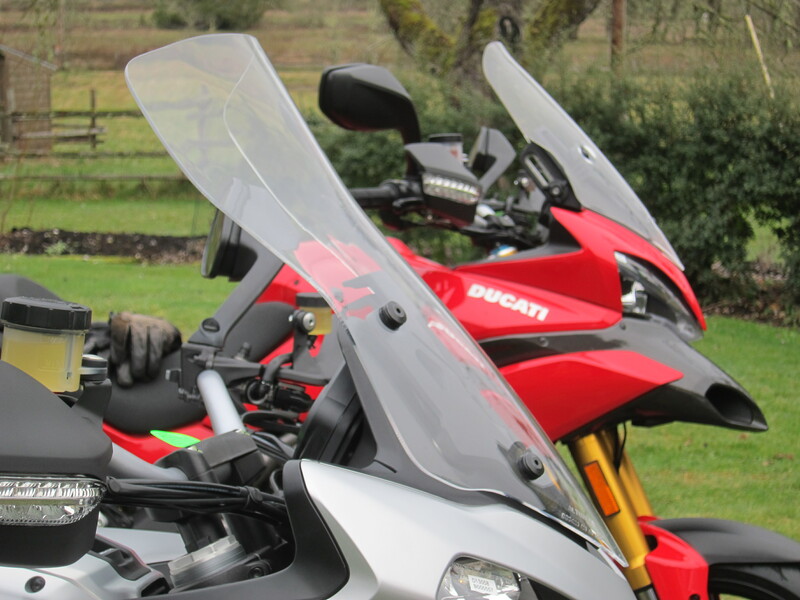 The 2010-12 bikes show the raw character that makes the Multistrada more connected to the racing origins of the 1198 motor. For a little while, as “stocks last” people have a choice. That is what I was trying to portray on my story, but not hiding my preference for the 2013. Thanks for writing Edwin. And I agree with everything you stated. And wish you many great rides on your GreyDuc Bird of Prey. You’ve made me want to test ride one and see for myself. Loved you article especially the great pictures. Thanks Edwin! If you take a 2013 for a test ride, I would like to hear your take on it. Having ridden a 2012 MTS 1200 S Touring for a whole year in the Dolomites, on Italian freeways and even at the Mugello track, I must say that I cannot conceive how Ducati could have improved its already superb engine and agile handling. But if they did, as your review concludes, kudos to Ducati! You said nothing of one of the most annoying feature on the 2010-12 bike, which is the very heavy center stand that interferes with the rider’s heels if one rides it with the ball of the feet on the pegs. I took my off right away and never looked back. Is the 2013 center stand lighter and less annoying than its predecessor? Unfortunately the center stand is still there. If you place the ball of your feet on the pegs, your left foot will hit it. Thanks for bringing it up, I was going to talk about it and forgot to include it in my narrative. In terms of performance of the new bike, it probably will depend more on the suspension than the motor when you are talking about comparing the two bikes on the track. And I think at that level, I don’t know if anyone has taken both bikes to the track to compare the Skyhook semi-active bike with the Ohlins bike. That is something that honestly does not interest me as much. But I know many of the Multistrada owners will want to know. Dolimiti, you said? My family originally comes from the Dolomiti, many generations ago before they moved to Fonzaso in Belluno and from there to the Americas, they were originally from Agordo, and it is what my name says, Di Agordo, but in dialect. P.S. : Can’t believe that Ducati could not fix the design fault of the MTS’ center stand! It may not be relevant to the majority of MTS owners, but nonetheless that center stand is a major annoyance for the many who take the sport side of the bike seriously and like to ride it aggressively and shift in the saddle in the turns! Lago di Garda is really nice, your bike is in one beautiful part of this world. I’ve been to Agordo and Fonzaso a few times to meet relatives. And about renting a Ducati for the DDT, I have a very good friend of mine in Lucca, where I stay when I go to Italy. The DDT is something to consider, I will take a look at the DDT link. Thanks! Thanks for your write up. Well done. It appears that the instrument cluster is larger on the 2013 with a slightly different layout. Was this a very significant difference? I’m not sure it is larger, nor that that it has a different lay out (the larger portion of the instrument cluster). The round part yes, same size, I think, but it has more information. This new information is related to the new suspension, the new ABS system, and the traction control. For the DSS, each of the four modes has a 5 level system from hard to soft, which are independent font and rear: five settings for the forks and five for the rear suspension. The ABS is a three level system, with levels of engagement and linkages, and it has also an OFF setting. The DTC is an 8-level system. I’m not sure how is it different from the previous bikes in terms of settings, but I its engagement is more subtle. Thanks for reading and commenting, Gil! I picked up the MTS Pikes Peak in August. Got about 5k miles already. Love it. Came over from motocross to street and this was my first choice. No complaints other than I had a warranty replacement for the entire instrument panel. Nice to know more people with this nice bike. I’ve heard of other people with a similar problem with their instrument panel. Thanks for writing this note. Your story shows how kindly one can write about bikes. Without hiding your preferences but without pushing them too. Very informative, very helpul. You get the overall idea of the differences between the bikes but can also focus on important details. Thank you very much. I am now in a similar process as you… Considering to swap my gs adventure to pikes peak. I will not tedt ride ducati though. Just in case:) best regards. Yes, I had a preference, and I exercised it. And I agree with you, it is very difficult to really write about anything without losing objectivity at one point or another, but I do try my best. In the end, I really appreciate how well the motorcycle adventure segment is populated by wonderful machines. I’m writing about the new GS that I got to ride last weekend. It was a positive experience. 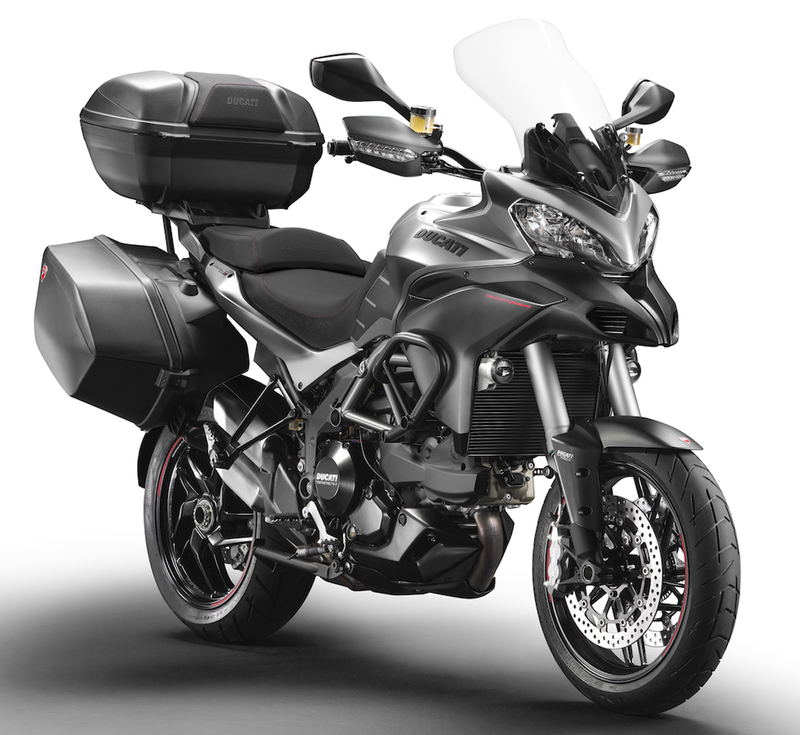 Even if I prefer the Multistrada, I do believe the 2013 GS is more road friendly than previous models without losing the character that made the GS be what it is, the gold standard for large adventure motorcycles. I know some people have modified the center stand by shortening the extension and it has given the clearance for the left heel ad it is still operational. I’m about to pull the trigger on a 2013 Multi- will ride the Crosstourer 1200X (DCT!) as a touchstone before I do. Rode the Triumph 1200 and it was heavy and slow handling but an awesome motor. I HAVE TO SAY: This was the very best and most helpful review I’ve read on the Skyhook model – THANK YOU VERY MUCH. I really appreciated the unique writing style, I felt I was being spoken to directly, as a mate – surely the mark of a talented writer. Here in Australia the 2013’s are only just arriving so a ride is close. I rode a 2010 about 2 years ago so I’m busting to try this toy! Thanks again for a valuable and enjoyable review!!! Cheers, Brian – (Sydney Australia). First of all, thank you very much for your comments on my review. Perhaps my writing style reflects what I am: just a fellow rider with no economic interest in any specific motorcycle brand, except that I want the motorcycle industry to be healthy, responsive to customers, and that they develop great bikes to feed our riding passion. And the adventure segment is really booming right now. 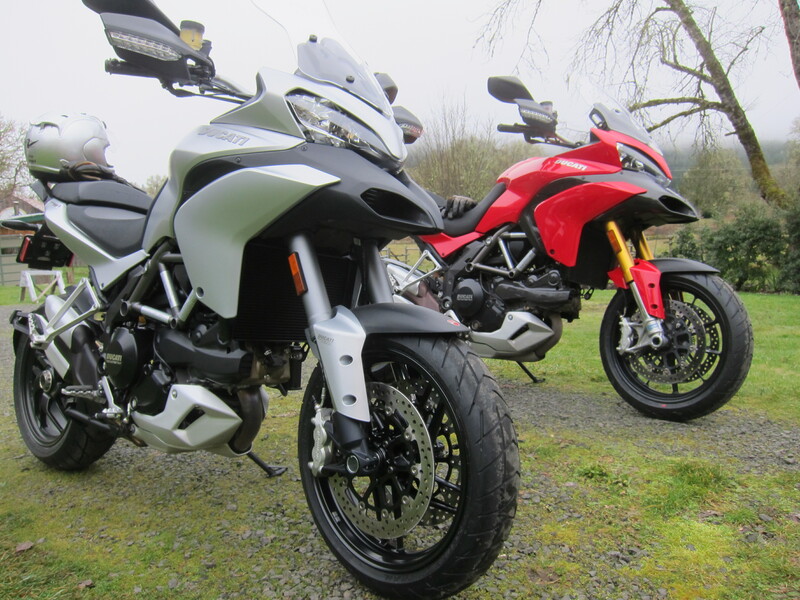 On last count, we now have eight manufacturers offering 1,200 cc adventure bikes in 2013, and three of them offer bikes with the semi-active suspension (BMW with its GS, Aprilia with its new Caponord, and of course Ducati with its Multistrada). I hope you like the Multistrada. But if you don’t, it is good that there are so many options out there. Great review. Well done for that. I have had my 2011 mts s tourer for about a year now and had ventured across Spain and France on it, being frim the uk you definatly can tell the difference in the roads and drivers. The bike is a great bike apart from the wind noise and poor fuel consumption but tbh I dose not matter it’s a great ride and the power is fantastic. With that I will be trading my one in for the new 2013 grantorismo in a few days and looking forward to it. With another trip booked in July traveling through 8 countries in 14 days I can wait. Just hope the wind noise is better. Once again thanks for the great review, puts a smile on face now knowingly I’ve made the right decision to upgrade. I think the GranTurismo is going to be a great bike. In a certain way, I’ve made my Pikes Peak a bit more “touring” by adding the center stand, the side bags. My philosophy is to carry light loads. I still haven’t packed my Ducati for a long trip yet, just to see what I can really carry on the smaller panniers (smaller than what you will get on the GranTurismo, but another local guy got the Pikes Peak and then bought the larger GT panniers). The one thing I’m really curious is the larger windscreen on the GranTurismo. The regular 2013 screen is already an improvement from the 2010-12 screens. But it can be better, and I hope the GT will offer that. By the way, I tested the BMW 2013 and its new screen, on the highest position, was the best I’ve found from an OEM screen so far, knowing it is always a personal thing due to torso height and riding preference. Hope you get you GT soon! thanks for the great review. I thought I head read everything there was to read on the 2013 Multistrada, and I think I’ve probably read Kevin Ash’s (R.I.P) excellent assessment 10 times, extracting every morsel of information form it, but I’m glad I found yours – such a casual, ‘real’ and highly informative style. I wonder, though, if I would still have £17K in my pocket rather than my local Ducati dealerships bank account if I’d read yours just one week ago – maybe I would have taken your advice and NOT test ridden one. But I did. And you was right. But at least, like Qbic, I’m getting that warm feeling as a result of reading your report that I’ve made a good decision. The test ride was on an ‘S’ model and my only gripe was with the wind noise. I tried the screen in various positions at various speeds (partly for the novelty of adjusting it on the move to be honest) but it never got quiet. So I’m hoping that the different screen on the Granturismo that I’ve ordered will be better. We’ll see. Maybe I’ll post my findings on here. Yes, the windscreen on the 2013 is better than the ones on the previous models, but it still is a problem when speeds go north of 65mph, in my view. I’ve tried the touring screen on my bike but now I’m settled on the pikes peak carbon fiber shorty. It gives a more clean air scenario. I still hear some turbulence but not as much as I do with the touring screen. I’m hoping to hear from people who will try the GT screen, so please post your findings here! Otherwise, I’m settled with the shorty, that actually looks really nice in the Pikes Peak bike. Diavel Strada and the dealer suggested that I try out the Multistrada GT, just for comparison. I rode the MTS first and was amazed how comfortable the bike was (as well as light and fast). I came back after 1/2 hour, and jumped on the Diavel. I couldn’t get back to the dealer fast enough. I fell in love with the Multi. The Diavel locked me into a very tight, almost drag racing position, while the MTS felt so natural that I could ride it for 12 hours in a day without feeling cramped up or soar. One usually has to do some highway miles in my neck of the woods to get to the twisties, and this is the one bike with the dual personality. 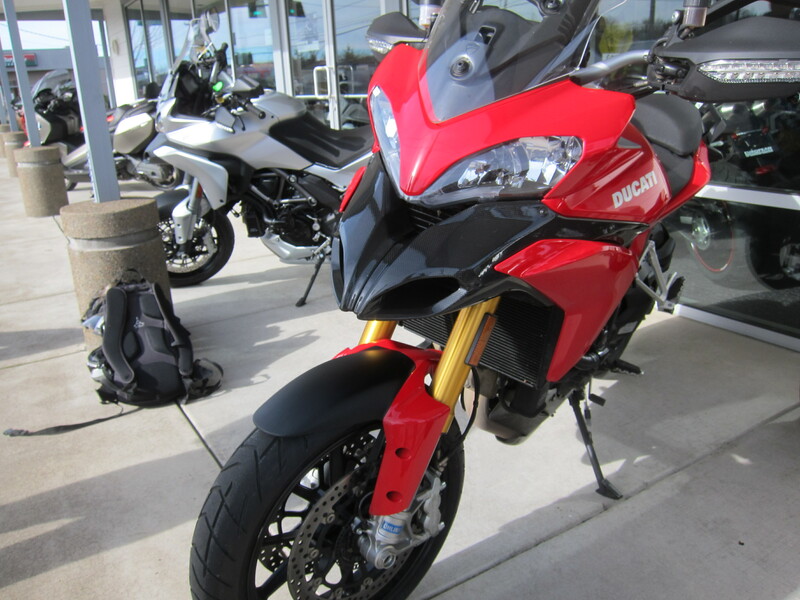 I ordered my “Ducati Red” MTS 1200S and am picking it up today. Paul, congratulations on your new bike. I’ve tested the Diavel, I liked it, but it will be for another time in my life. For now, it is Multistrada all the way, it is such a joy to ride this machine. I just got back from a 920 miles trip to California (460 miles each way) with the Multistrada. Touring with Sport spices here and there. I’ll have a report here at some point later. Enjoy your bike, Paul. After having the bike for all of 2 days now, and 200 miles later, I must say, this is by far, the most fun bike I have ever ridden. I have owned over 30 motorcycles, sport bikes, cruisers, dirt bikes, dual sports, a chopper, a custom, but never a Ducati before. Two comments: best handling bike I have owned, and best motor. 2013 has big improvement in low end drivability over previous models. Also, to my surprise, the stock windscreen was great. Up position on the freeways, down everywhere else. That is, with a full face helmet (didn’t even need to wear earplugs). Touring mode on the freeway, sport everywhere else. Looking forward to hitting some dirt roads. Lots of them where I live, just don’t want to get the new bike too dirty quite yet. Paul, I’m really glad to know you are getting along well with the Multistrada. It is my favorite by a great margin! Keep me posted on the dirt riding. I was with mine on a short stretch on dirt, with some sand, and the front was digging too much. I’m sure it will do better on gravel over hard packed dirt. One thing to consider is related to tires, I’m not sure how well the Scorpions handle gravel and dirt without falling apart. Cesar, good information on the tires. I’m going to watch these tires carefully. They are known to have a short life span to begin with. As a side note, the standard paniers are not very user friendly. They are only useful for carrying items for an overnighter, or keeping layers of clothing. Are there aftermarket liners that are less expensive than the Ducati option, that take up close to the same amount of space? Be advised that the Ducati liner/bags for the side panniers and trunk are very good quality, but the right hand side bag IS NOT sewn to match the exhaust “bulge”. This is a problem as anything you put in the bag naturally falls to the bottom and then won’t fit when you try to close the pannier. My wife has agreed “in principle” to sew up the bag to match the physical dimension of the right hand pannier…to be continued. Thank you Bob. I just experienced that on a trip last weekend with my Multistrada. I do not have the liner/bags, but used my own bags and had to “adjust” it, which meant push and move things around to have the bag fit the exhaust side pannier. Overall, both panniers do not offer much room. I realize I may need to go with the top trunk when I really need to carry more luggage with me on longer trips. I’m not sure about aftermarket options, but I’ve seen the liners and Bob is correct on his assessment about how they fit. I will buy the liners, after this weekend trip I realized they should make packing easier, even of the exhaust side pannier has less width than the liner. Also, it is easier not to pack hard objects, such as shoes, on the smaller pannier, so you can accommodate the bag better on that smaller space. How will the grandturismo handle on the gravel…..offroad, on touring through Africa? and compared to bmw 1200 gs? KTM ?? I would say the BMW and the KTM will do better touring Africa. But you will look more adventurous, it will be a unique experience, riding the Ducati when touring through Africa. If I were the one doing this trip, though, I would pick the BMW or the KTM. Hello. What about the pictures of the headlight at night time?. One of the thing that interest me about this new technology of LED in the headlight, it’s how they perform against the traditional halogen headlight. I have not ridden this motorcycle at night. During the day, my impression is that this motorcycle is more visible to cars, as they appear to avoid merging the road ahead of me from larger distances. Once I approach them from the back, they take less time to see me and move over to let me pass. 2) should I get base model or the S? This would be my first adventure bike coming from riding super bikes all life..
That is an important decision, both because these bikes are expensive, second because you are changing from sport bikes to a sport/touring/adventure bike. My recommendation is to ask the dealership to give you seat time on these bikes. First of all, you need to know if the Multistrada ergos will be fine for you. They are heavier, bigger, taller motorcycles when compared with what you’ve been riding. And then there are the wind screens. The 2012 and 2013 have the same ergos, but different wind screens. To some people, that is a decisive factor. The 2013 has an improved windscreen, but it is only good enough. Second, besides the suspension, there is a major difference on the motors of these two bikes. Although some people swear by the 2010-12 models, I really feel the 2013’s have a much improved motor. When comparing with riders on 2012 bikes, my fuel consumption is consistently better than theirs (I can run 200 miles between fuel tanks, they need to refuel at 180 miles). And the 2013’s are so much smoother on low revs, it makes quite a difference in my opinion. Third, the suspension. Skyhook vs Ohlins. It is a first year for the Sachs suspension and a semi-active suspension at that. I have had no problems with mine, and I really love this suspension. But the Ohlins name carries prestige. On the other hand, if you are heavier than 180 lbs, you may need an upgrade on the rear springs of the ohlins bike. Something you don’t need on the Sachs suspended bike, as it comes with a dual stage spring. Fourth, the 2012 has the big discount on price… if money is something that matters to you, that is, you like the feeling of having gotten a good deal, well, then you have to factor that in your equation. If when you ride that is something that will be constantly on the back of your mind, the more expensive bike may not be good enough to make the ride satisfactory. Having said all of this, I personally never had a dilemma between the two bikes. When the 13’s came out, I took them for a test ride, I felt it was a night and day difference on the motor between the two bikes: I bought the bike that spoke to me. And that’s why I recommend you take both of them on long test rides. I haven’t ridden a big street bike for 20 years (rode enduro and MX until 8 years ago) My first bike was a Ducati Monza 250 back in the early 70’s. Anyway I saw the 2013 Multistrada S Tourer at a show in Bangkok and bought it on the spot without having driven any Ducati since the 70’s. What a fantastic machine to ride, except for the slight surging at low rpm (EU emission to blame for this I believe) it is faultless to ride. Nothing I have ridden comes close. Like he says if you ride it you have to buy one, despite the cost. Full Termi exhaust eliminated the low rpm surge on my MTS, but the location of the Termi muffler outlet required me to get an aftermarket tail light bracket (the OEM unit was in line with the exhaust and melted). Also, changed harmonics with the Termi exhaust required bar end weights to mitigate an annoying handlebar buzzing. End result…no surge, a slight performance gain, great sound, a better look IMHO (the “tumor” is gone), but a much lightened wallet. Bob – I take it you have a 2012 model? I have an exhaust system on my short list, as I feel as though the stock catalytic converter/muffler is too restrictive, and my 2013 doesn’t seem to want to rev out up on top, as though it is struggling to relieve itself above 7500 rpm. Does the full Termi system change that feeling? I have a 2010 MTS1200…I said 2012 in an earlier posting…sorry, senior moment/typo. In any case, the “feeling” of the Termi exhaust to me is that it is slightly less torquey from lower rpm (below 4000), but anything north of that, the engine accelerates more aggressively to its aerodynamic “wall”…on my bike an indicated 156mph (with side panniers and top trunk)…actual mph probably about 145+. I orginally had the exhaust installed and mapped with the muffler insert left in…big mistake as the bike ran very poorly. Removing the insert and mapping to it’s “intended design” spec’s was the solution…it’s frankly not that loud anyway…a whole lot less than most HD exhausts in my area of the US (southeast). Bob – The new Termi full systems come with a remapped ECU, which my guess is designed for use with the DB Killer installed in the tail pipe. Do you think I might be better off buying an aftermarket full system, and having the ECU remapped for that system, instead of buying the Termi system and still having to go outside the dealership to get a remap? There are full systems (or almost full systems minus the headers) from Arrow, Leo Vance, and QD Systems (really nice looking duals). Everything else appears to be less money than the full Termi package, but the Termi pkg maintains a full factory warranty. I had all my work done by my dealer…mapping/tuning for the system with/without the dB killer. In my opinion the Termignoni system is typical of Italian products…beautiful, functional and expensive. I am sure other manufacturers have quality exhausts available for the MTS1200…I am just not knowledgable on the other systems. My guess Cesar could offer alternatives. Good luck. Paul and Bob, I did not research anything related to full exhaust systems. But if I were going to do anything to this bike that would involve a change to its original ECU map, I would certainly want to have the appropriate technical support behind. Any of these exhaust options involve a good amount of money, on top of an expensive motorcycle. You want to make sure it will work well. Especially with the 2013’s that deliver a nice and smooth performance out of the box. Already been to the Ducati shop to check out another exhaust. The slip on alternative appeared to be just a cosmetic accessory at a high price ( around 40,000 Thai Baht new UD$1,333) so I declined. I think the Cat may be part of the problem so I’m going to look into having an alternative section of exhaust made locally to replace it. Hopefully it will make it sound a lot better as well as making it run cleaner at low rpm. Hi again Cesar, As I wrote back on 7th April, I’m about to buy a Skyhook multi. I’m going to wait another month to see the secrets of the 2014 model. If it is not compelling I’ll pull the trigger on the ’13 immediately. September has traditionally been the date for info release on the next model. I’m glad I waited after riding the 2010 model as it seems they have fixed the non-existent rear brake and the gammy low speed rough running now. As a few have mentioned here, re the exhaust, it is diffucult to know the best option to ditching the boat anchor lump cat converter. I was all for the full race Termi until I saw the wonderful looking and SOUNDING QD twin pipe model. The only reasons I’d still consider the full Termi are the factory integration and warranty. Still, the look and sound of the QD is intoxicating and is the sound only a true Ducati is capable of – almost like a true full length dual system. For the life of me I can’t fathom why on earth there’s nobody making a ‘2 into 2’ system – from exhaust port to tail pipe – two dedicated separate pipes like the old days. I’ve heard it said, incredibly, there is a power sacrifice using 2 separate pipes instead of the current ‘2 into 1’ on the Multi and all similar water cooled injected modern bikes. Anyone care to comment on that alleged power loss please? The sound alone might be worth any slight power drop. Just boggles my mind no one has done it yet. Nothing like the sound of a TRUE stereo Ducati!! And that’s coming from someone who’s ridden jap bikes all his 52 years and not yet owned a Duc! Brian, I agree with you on the sounds (and looks!) of the QD twin pipe system. Why not a ‘2 into 2’ system? It is only my guess, but one of the reasons could be the catalytic converter and all the stuff associated with it, the boat anchor you refer to. There may be other reasons too. It is about time you get to ride something different! great review, pushed my decision to buy the MTS PP 2013 in April this Year. Still totaly happy with this bike and zero Problems after 10.000 KM. Estou desde o lançamento desta moto em 2010, lendo e pesquisando sobre ela e sem dúvida a melhor e mais isenta opinião li aqui em seu blog, tirando-me todas as dúvidas que ainda restavam sobre se seria ou não uma boa escolha a MTS , após 6 anos de uma excelente VStrom1000! Só mais uma dúvida, você acha que toda está eletrônica é estável a médio e longo prazo, ou seja, não começará a ter problemas ? Obrigado pelo comentario Mauro. Sobre os equipamentos eletronicos, nao tenha duvida, alguma coisa ou outra podera’ falhar. Na verdade ja’ tem uma campanha pela Ducati para mudar a rota da fiacao que vai a um dos aceleremetros da roda traseira. A fiacao fica muito extendida, do jeito que foi instalada. Minha recomendacao e’ comprar uma garantia alem dos dois anos que a Ducati oferece. It is about buying peace of mind. A VStrom e’ uma moto excelente. Mas a Multi e’ exceptional. Ma socmo tudo na vida, o simples e’ comum mas te garante a durabilidade, o complicado tem o prazer e junto vem os problemas. Como mulher bonita. Grande abraco, Cesar. Hi Cesar, thanks for the comprehensive and very intuitive writeup…I’m actually a Harley guy (please no bashing…a CVO Breakout and an anniversary Road King), as well as a 2011 Pikes Peak…European specs so it came with the Termi Slip Ons…Absolutely love the bike, the 4 in 1 capability (here in Beirut Lebanon, one minute you’re zipping through the city, then on the coastal highway then on to the mountains with very bad pavement…so it’s really the perfect bike. HOWEVER, my buddy got the Diavel Strada and I am intrigued….having had two rotator cuff repair surgeries on my shoulders , the Pikes Peak puts a little pressure on my shoulders that my HD bikes don’t. The Diavel Strada with its reached back handlebars was also very comfy for me…have u ridden the Diavel and how does it compare. Finally, do you know if its possible to retrofit the new LED lights on the 2011 model?? Yes, Ive ridden the Diavel Strada (if you click on “bike reviews” you will find my review of the Diavel) . It is not as engaging as the Multistrada. It has the power, it is there if you want it, but you have to ask for it. The Multistrada in sport mode is always ready for the challenge. I think this is because of the Diavel being a heavier bike and I’ve heard it has a heavier flywheel when compared to the Multistrada. Having said that, I agree with you, the Diavel sounds better, and it is a more comfortable bike. If you like cruisers, the Diavel is closer to giving you that experience: Handlebars come to you, pegs are, I think more forward positioned than the Multistrada’s pegs. I don’t know why the Diavel sounds better, but it does. I would believe a full exhaust system in the Multistrada will make it sound better, but I have a feeling it will be different than the Diavel. I don’t know if you can retrofit the 2013 LED lights in the 2011. For one thing the shape of the headlights is different, and the LED, at least the parking lights part of it, are integral to the shape of the mirror. I’m not sure about the main bulbs though. I would ask at a dealer. I’m glad you are enjoying the Ohlins Semi-Active upgrade. That’s one thing that really differentiates the new bikes – the semi-active suspension – which are available in many bikes these days. Something I’m not sure is available for the Diavel, though. In terms of your decision, well, I would say eventually I’m moving out of the Multistrada for something more manageable. But for now, it is my favorite bike. p.s. I have no prejudice against Harley Davidson motorcycles. A rider is a rider no matter what his/her bike is. 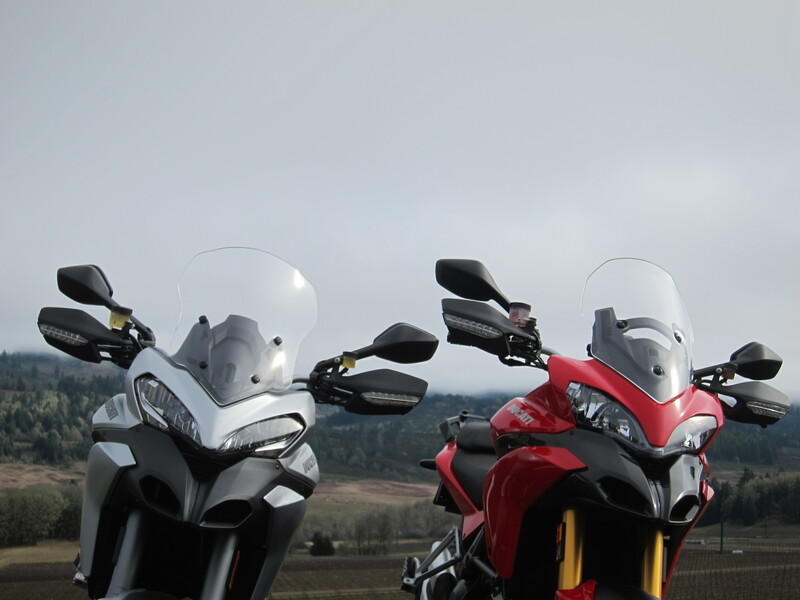 What I mean by that is that the Multistrada is a tall motorcycle. At some point, as I get older, I will probably need to get something lower to the ground, like the Diavel is. Or something lighter, like the Hyperstrada or that nice looking new Hypermotard are. But still stay in the Ducati line. I like the F800GS, I have a Tiger 800XC, and I can’t see myself having only one or the other (800 cc enduro vs 1200 cc sport touring). 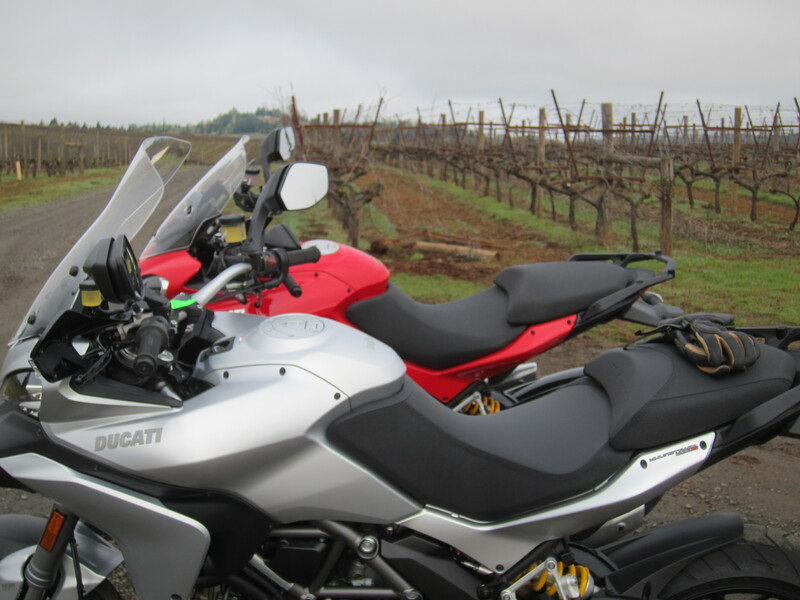 I like having both the Multistrada and the 800cc enduro bike, as I want to ride on gravel – which is something we have a lot here in the Western USA. I don’t think the Multistrada works too well on gravel roads. You can do it, but it is not that best tool for the job. Hope I answered your question. 2 weeks ago I bought a new 2013 MTS 1200 S Touring. I have had the 2010 standard model for the last 16 months & loved it. The new bike is much smoother at low revs. The old one used to chug a bit at slow traffic speeds, the new one can sit easily at 2,500 revs in 4th gear. It seems to be smoother under fast acceleration although I’m still running it in and haven’t opened it up fully. I thought the old standard suspension was great, it never bottomed out and soaked up all the bumps our rough Aussie roads dish out. But compared to the new sky hook it is chalk & cheese. the old was plush and a bit soft and the new skyhook is firmer,(I have not explored all the adjustment options yet) but it does keep the bike quite level. Very little dive under brakes or squat in the back. It comes into it’s own when 2 up with luggage. It handles the load much better than any bike I’ve ridden. Very confidence inspiring. My wife even commented how she feels safer under brakes as the bike stays level. The windscreen is marginally better, but still noisy. I am 6 feet tall. I am going to play with a laminar lip and spacers to get it better. The seat is longer with more room it’s but harder and I need to stand up after about 1 1/2 hrs in the saddle. Air hawk is on order and hopefully arrives today. Overall it is a fantastic bike and worth the inflated Ducati prices, High performance, great handling, and a good improvement on the older model. Thank you for your note and comments Kent. We are in the beginning of a very harsh winter here, I’m already counting the days for Spring and back to the riding days. I go to the garage often and stare at the bikes, especially my favorite, the Multistrada, and day dream about my next ride. Bought my 2013 mult, just had a first service and went touring. Fantastic handling throughout the Maehongsong loop in Thailand, but do not go on any rough roads I managed to buckle both wheels in under 20000 k. As an adventure bike it fails miserably on the strength of the wheels. As a fast touring road bike it’s amazing, stable with fantastic breaking power. Footrests scraping no problem.. But what a let down with the soft wheels only good on nice roads. Everything else is top notch. Yep, not the best bike for venturing off pavement. I haven’t taken mine off pavement yet, don’t think I will ever do. But if I ever do, it will likely be on graded gravel roads. It is a great sport touring machine, though. Hi again cesardagord, I last posted here in August’13 talking about buying a 2014 Multi. Well, I finally did it. I got the 2014 GT. The only change I understand is the colour as you can now get your GT in RED! Thought the tyres, higher bars & windscreen plus the panniers and top box would suit me. Anyway it is lovely as the honeymoon is really in full swing with only 300kms on the clock. 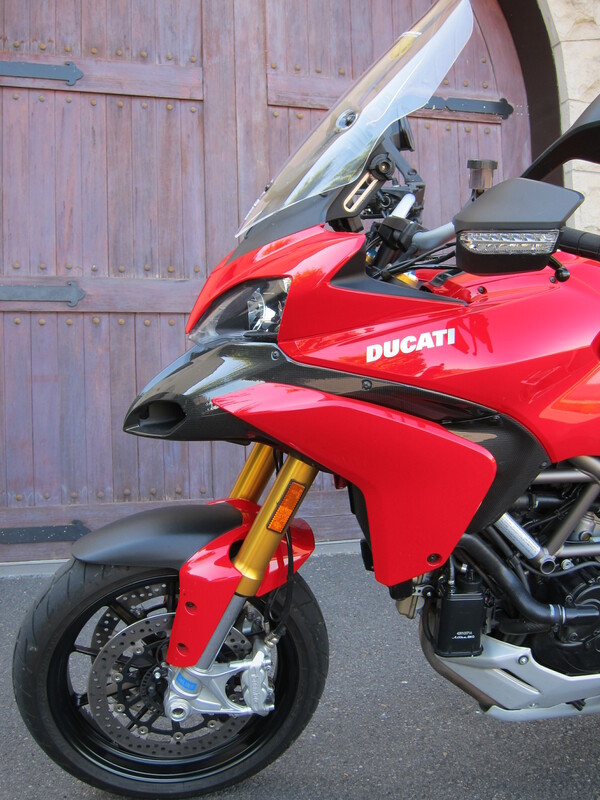 I’ve decided to get the Italian Quatt-D (QD) exhaust system just after the 1st (1,000kms) service so as not to upset the Duc importers here in Australia – they do the servicing and warranty. They have been known to take a dim view of aftermaret stuff not called ‘Termi’ if theres a warranty issue with anything. Stock, the damn thing sounds like a warmed up Honda XL600 single and totally invisible to cars it is that quiet. Fancy, Ducati of all makers creating something so audibly ineffectual. 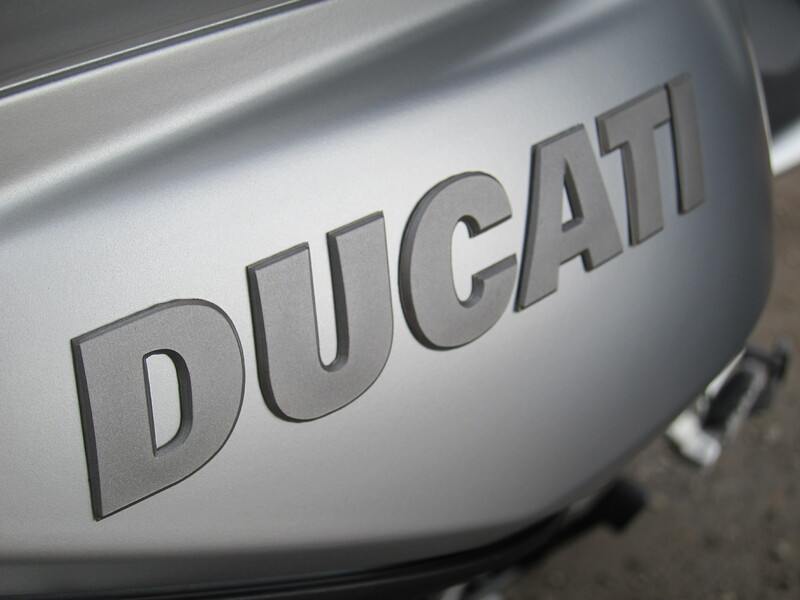 The QD is the only system that is capable of making it sound like a REAL Ducati. I know, because I’ve spent countless (and I mean countless!) hours on the forums and you tube reading and listening to ALL of the known options. Trust me, unless you are running QD your Multi won’t sound like a true Duc. There are some very nice systems including the full Termi, Akra, Arrow and many other BUT they all sound like just a louder and fuller SINGLE exhaust system. I don’t know how QD have done it but even though it comes from the same pipe config as many others it sounds like a twin. Sure, there’s the twin-set tail pipes branching off from the joined single like all the others but damn it the thing sounds full of bass and seems to have the stereo throb of old Ducatis – NOTHING like the other aftermarket ‘two-into-one’ pipes today. Bloody hard things to get theses QD pipes. The supplier in Italy is scant on details and email chats and getting info is like pulling teeth. You would really have to know it was what you wanted, to go through the process to get one set from these people. I was tempted by the full Termi, being the factory recommended one, as it has the new map and air cleaner included and wouldn’t create drama during warranty. Just couldn’t forget that stereo bass rumble from the QD’s though. Getting rid of the CAT was a big motivator for me. It is now widely acknowledged in the Duc community that the CAT is the cause of the mostly non-existent rear brake. The main brake reservoir sits just above the CAT and heats up to the point that it kills the oil, turning it black. Mind-numbing how Ducati could create such a major flaw like that and even worse have not fixed it by MOVING the oil pot away to a cooler area (after FOUR YEARS in production! The only real fix is to get rid of the CAT and that’s a great excuse for a new pipe system. I’ll have another 10HP and trim about 10 – 15kg’s from the weight – and with sound to die for. How could anyone not love THAT! Hope all is well with you mate – stay shiny side up and enjoy your bikes. We’re all here for a good time – NOT a long time – Brian. Thanks for the update. And for the QD videos. I have no question that if I ever went the route of a full system, that is what I would like to instal in my bike. It sounds and looks great too. Al is well with me, although I crave for a ride, once again we are having a tough winter around these parts of the world. Between travel and winter, I haven’t ridden my bikes since October last year. This is simply crazy. I was just out in the garage checking the battery tender and moving it from bike to bike. Yes, we don’t have along time, so we enjoy what we have. Best wishes to you and your RED GT. I took a 2012 on a 7k trip around USA…it was great! 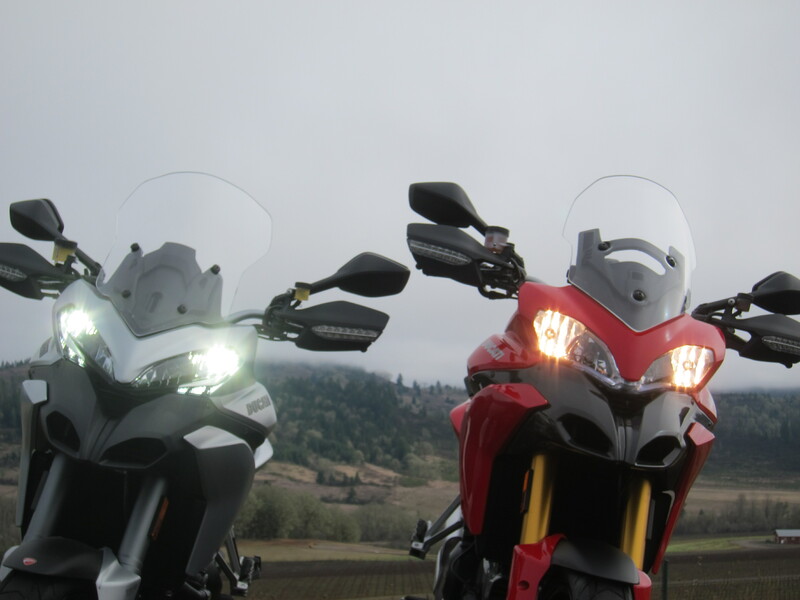 Hey Mike, we will have to wait a little bit more to see what is new with the 2015 Multistrada. Have you checked out the new 15 model yet? I have studied it, I have seen it, have sat on it, I have played with the bike’s computers via its dash board. But I have not ridden it. Yet. Hopefully soon. Thanks Johnny!